Freshman guard Maddie Loder put up a career-high 15 points against Towson but is only averaging 4.2 points per game. Women’s basketball struggling to find a steady offensive strategy 10 contests into its season. 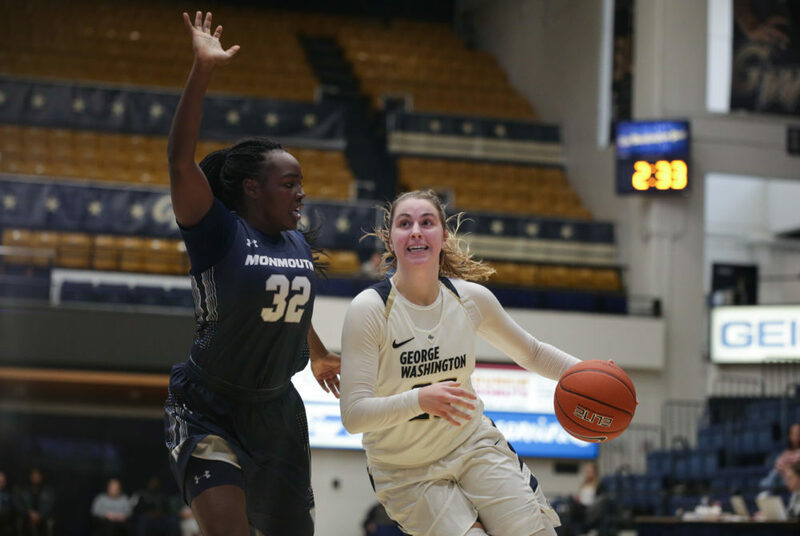 While GW has shown moments of strong defensive play, a signature of head coach Jennifer Rizzotti, a severe lack of firepower on the offensive end of the court has troubled the Colonials (2-8), who have yet to string together more than two wins in a row. While Rizzotti said she front-loads her team’s schedule to force them to gain experience against top-tier opposition, the Colonials are struggling more so this season than in previous years. The Colonials only tallied one more victory in the wins column through 10 games last year, but GW was performing better on the offensive side of the ball, generating greater point production even though the team was giving up more points. Through 10 games last season, the Colonials averaged 62.9 points per game and gave up an average of 67.9 points. But now GW is averaging 49.2 points per game while allowing opponents to average 60.0 points. Last season’s higher-powered offense allowed GW to finish matches closer to their opponents, but now the team has been falling in double-digit blowouts. This season the Colonials have been held to two 30-point performances but the team’s lowest nonconference point tally last season was 44 points. The Colonials’ top-scoring duo has been senior guard Mei-Lyn Bautista and sophomore forward Neila Luma, who are averaging 11.0 and 10.1 points per game, respectively. Rizzotti said players like Bautista and Luma can get open and create their own shots on the floor, but the rest of the team has been relying on offensive sets to find space, which has caused the Colonials to struggle when teams are disrupting their game. Rizzotti said repeated losses against powerhouse programs may have a negative effect on players’ confidence, but her hope is that weathering early-season losses will pay off down the road, both in the development of the young players on the roster and the team’s overall performance against conference foes. A positive for GW has been its tough defense, which limited Maryland to what was its lowest point total of the season at the time. Opponents have averaged 60.0 points per game against the Colonials, which is impressive given the tough offensive opponents Rizzotti has matched her team up against. GW squared off against two ranked opponents this year: then-No. 9 Maryland and No. 13 NC State. The Colonials have also taken on Ivy League champions Princeton and a tough Georgia Tech team. In one of GW’s strongest performances of the season, a closely contested 69–61 loss to then-No. 15 NC State, the Colonials’ offense outshot the Wolfpack from beyond the arc and played tight defense to be competitive against one of the top programs in the country. The game showed a frustrating sign of how good the GW squad can be, but they have failed to do so consistently so far this term.